The Kitty/Collosus scene was drawn by Chris Sprouse and Terry Austin. Paul Smith drew part of the later Magneto/Xavier discussion which was inked by Tom Palmer which is why it doesn’t look very Smithy. I imagine Feral was at the funeral because she’d heard there was a buffet and open bar afterwards. Magik was on the team which helped rescue Psylocke from Mojo and Spiral (Betsy’s first contact with the X-verse was the New Mutants rather than the X-Men) so Psylocke being there I’d buy. Amara has not got a good track record for such things. She wasn’t there for Doug’s funeral (She was with the Hellions by then, but you think she’d at least have shown up for that, and Emma would hopefully have allowed it due to their alliance), or Warlock’s ash dumping, so not showing for Li’l Illyana, a character she’d only known as a teenager (She joined the New Mutants after Illyana aged up, and left before she de-aged) is more or less par for the course. Presumably she offered a prayer to Pluto in her own time and moved on. Agree with Miles that Rahne’s absence was inexcusable. I am shocked you overlooked Roberto and Sam’s magnum rewatch podcast. I think it would mostly be Roberto, with whichever one of the other NM’s is too slow to clear the room when he comes looking for a co-host. I’m with Jay about softcover comics collections – I picked up the first paperback omnibus of Battle Angel Alita: Last Order, and I’m scared to death over that book falling apart. The hardcover omnibus volumes Vertical had for the main Battle Angel Alita series worked so much better. Also, I really appreciate having all the ads when I’m reading older comics, as I feel I’m getting a lot more societal context for the story and who it’s being written for (or who people think it’s being written for). That’s one of the reason why I really liked the old GITCorp collections – I missed the Marvel collections they did (including the X-Men one), but I was lucky enough to get the Star Trek collection, which is a big part of my collection. Oh, and those sound effects for Magneto were *really* good. On Cyclops’ file folder sorting methods. Scott sees the entire world in redscale but there are still hue and tint variations within the colors he can see. I imagine the world for him might be something akin to a unique sort of color-blindness. But knowing Scott I don’t think that this would prevent him from using color coding to categorize folders, it would merely make it difficult for everyone else to interpret those categories as colors that look very different to Scott might look very similar to his peers. I remember growing up with a color blind sibling and seeing him separate Legos by color… only to have red and green in the same pile and a pile for “white” and Purple” that were slightly different shades of gray. So Scott’s files might not be coded with blue, red, yellow… they might be coded with 30% warm gray, 50% warm gray, 20% cool gray, burnt sienna, auburn, and Siena Blaze. I definitely buy that Scott would believe that organizational implementation is a romantic date activity. It probably should have been a warning that Jean had been replaced by the Phoenix when her color coding systems changed to only include shades of red and orange. But I guess if you’re Scott Summers red flags are just flags. Would Scott actually see in just redscale? I’ve wondered about the forever. If you wear red tinted glasses, your eyes adjust and you see colors, even if they look a little dimmer. (I’m pretty sure this is correct? It’s been a while.) I feel like the comics have described what Cyclops sees inconsistently. And I seem to remember X-Men: Evolution giving us two different Scott POVs – one red scale, one (in Blind Alley in season 3) in full though mildly red tinted colors. I’d love to hear an optometrist or biologist with an eye specialty describe what science suggests Scott would see. I am not an eyeball scientist. But I do also wonder about how Scott’s Power situation is different from just a regular dude wearing red shades. Honestly he should probably just be blind? I think whether or not Scott should be blind, and possibly even what colors he sees, may also depend on something that’s never really been clear: are his eyes constantly shooting optic blasts actively into his visor, or does the visor suppress the energy so it only shoots out when the visor or glasses come off? The Newtonian issue I’ve heard explained by the theory that Scott must actually have a small wormhole in his head, and his eyes function essentially as small portals to a pure force dimension. So, same question: when ruby quartz is present, are they just normal eyes, and it’s only when his eyes are exposed that the portal opens directly in front of each eye? It does seem like his view should be blocked when he’s actively blasting, which may be why he’s often depicted taking short, discrete “shots.” Then again, the nature of the medium is to show us discrete moments anyway, so it’s hard to say. I think the usual implication is that it’s blasting out of his eyes all the time, and the quartz mitigates the energy release completely. They’d have to, otherwise the impact of his force blasts would propel the glasses about a quarter of a mile in front of his face whenever he opened his eyes, and since the glasses are hooked around the back of his ears, they’d be sliced off by the legs (…arms? …. temples?) of the glasses as they shot forward! Back at the start of the time it was that Scott was continuously blasting and that he had to open the lense on his costumes glasses in order to fire his optic blasts. 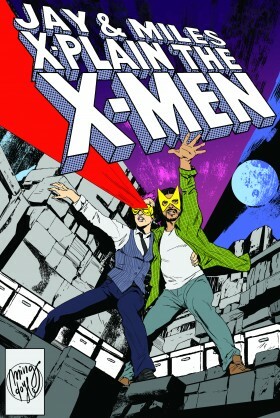 This was what happened in the first few issues of X-Men. This then got visual shorthanded to ‘Scott has his hand up to his visor while firing’ before at some point getting shorthanded even further to ‘artists and writers forgot about that little detail’. But then there was the time when Cyclops was on Octopusheim with Lee Forester and used a blindfold. I presume this was supposed to be so tight around his head that it kept his eyes closed no matter what as otherwise he would have blinked and blown away the blindfold. According to this Science of the X-Men book I bought 20 years ago, you are correct. The author says Cyclops’ eyes would adjust to the color shift and he could make out colors. The author suggests you can try it for yourself by wearing red tinted glasses for a week. He does warn you that when you finally take off the red shades, your vision will be tinted green (or whatever the contrasting color of red is) until your eyes adjust back to normal. I was still collecting comics around this time and I remember any comic that was vaguely ‘special’ was late, the second part of the Cable limited series didn’t come out until after ‘Executioners Song’ was all published, the X-Men annual with Mastermind and the X-Cutioner came out after issues of Uncanny that dealt with Colossus being injured and then every issue of Fatal Attractions would be guarenteed to come out after issues of other famly books that would say what happened in them. I really need to start consistently listening to the acknowledgements. Magneto contemplating interrupting a bris. You kill me. Also, Magneto has apparently been secretly observing X-Factor and has learned their preferred method of entry. Who decided the Legacy Virus would be called, by apparently, EVERYONE, the Legacy Virus? The name makes no sense unless you know it’s origin, and no one knew it’s origin. even Mr Sinister, who opened the box that Stryfe gave him containing it, didn’t know it contained it, he just thought it was an empty box. So whose “legacy” did everyone think they were spontaneously talking about? It comes from the Stryfe’s Strike File entry on Illyana. How it spread outwards from there is unclear, but in the same way that a new villain can be created in one book, forgotten for a year and then appear in a completely different book and the hero will generally say something like “Aaaah, Antagonist Man? Didn’t you fight so-and-so a while back? Even though so-and-so and I have no reason to communicate as I am a beacon of light and truth and he is a gritty lowlife operating out of a different location? Splendid, let’s rumble!” it seems all heroes in a universe are connected by a low level telepathic field for ease of data transfer about villain tussles. Presumably Xavier mentioned this to Moira, who referred to it as such when alerting the WHO to this new disease threat. MAGNETOs 1st POWER USE: According to this it wasn’t killing the people that burned down the building with Anya in it, it was just b4 that. Shatterstar & Feral were just there for the food. Magneto mind-control forced Quicksilver/Scarlett Witch into being part of the Silver Age Brotherhood of evil mutants. PFF! I got the thin coating of metal over MY skeleton ripped otu the other day,, don’t hear me complaining! Jokes, no, that scene is soo EPIC/memorable. Aww bummer, u didnt cover Wolverine 75 (1993). Onsluts the WORST! ive never read the entire thing. The first use of Magneto’s powers was before Auschwitz. His powers saved him from the firing squad that killed his parents and sister, but he passed out and was buried along with them. Check out New Mutants #49. Of course, this may have been retconned by Magneto Testament. Unsurprisingly, I agree with our hosts about the lack of thought that went into the selection of people in the funeral, and see it as one more instance of the lazy contempt that Lobdell and Harras are displaying for Illyana as a character. I’ll add that — this is a small thing but it bothers me a little— that no thought went into thinking about how the memorial service might reflect that Illyana wasn’t American. Colossus is an atheist, which is the most we’ve ever heard about his family’s attitude to religion, I think, and this at least raises questions about the large cross. But if you decide that Christianity is appropriate, it would have been nice to think about ways in which it might have been specifically Russian Orthodox. Obviously, the handling of Magneto is poor in a similar way, but it’s not as bad, because the eeevil Magneto is so over the top that he comes across as completely [expletive deleted] crazy and maybe not responsible for his actions. I mean, Silver Age Magnero is looking at this guy and thinking that he’s maybe taking things a bit too far. Overall, this is really confirming for me my sense that the problem here is that this is Jim Lee’s vision of the X-Men: that they should go back to what “everyone knows” they are (although they actually had never been that most of the time). But in Lee’s version, what we saw of it, it seemed like that was going to be more exciting and fun than this. This is that, but with all the joy drained out of it. It’s sterile nostalgia without the saving grace of sterile nostalgia, that at least there’s an element of *love* for the past in it. And it seems utterly determined to believe that the key to the X-Men is that it’s always been about Charles [expletive deleted] Xavier. – “Hundreds, maybe thousands.” Think for a moment, Charles. The death toll has to be *much* higher than that. – I think that Scott Lobdell must think that Banshee is Scottish. – “You forced them to fall asleep!” Jean, as uses of telepathy go, that’s not really all that high on the invasive and unethical scale. Especially not by Charles Xavier’s standards. I think this issue also features an appearance of what I can only call “Multiple Monument Syndrome”. This is when a person’s gravestone/memorial never appears the same way twice. The worst case scenario of this can be seen in the DCU, and affects the Wayne family in particular, because the odds of ever finding two issues where Thomas and Martha Wayne have a consistent memorial are vanishingly small. The Waynes have had plain, side-by-side gravestones, a shared gravestone and at times some sort of full blown vault affair. Sometimes’ it granite or marble (of a variety of hues). Sometimes there’s a stone cross, sometimes there are angels, sometimes there’s nothing. Sometimes it’s SO damned Gothic that it’s like Anton Furst designs as realised by Mike Mignola. Basically the longer the person is dead and the more of an impact their death had, the more likely they are to suffer from Multiple Monument Syndrome. Here we see Doug Ramsey’s gravestone achieve the rare trick, even for a regular MMS sufferer like him, of looking completely different when it appears twice IN THE SAME ISSUE! Senyaka definitely really is dead here; at some point (maybe the Quicksilver/Heroes for Hire “Siege if Wundagore” crossover), Exodus learned a rez spell to explain writers being told “don’t create new Acolytes” and then being given a list that was half corpses. I duuno, we’ve still to meet the likes of the acid spewing Vindaloo, haven’t we? I’m confused by the mention of telepaths “going through the face.” Isn’t it true that Magneto’s helmet didn’t protect from telepathy back then? That was invented by the movies in the 2000s. That’s true. Juggernaut is the one with the tepe-proof helmet. The Prof didn’t have trouble attacking Magneto’s mind in Uncanny # 150, for example. I think the problem is that the mind proof helmet is such a good idea that it kind of feels like that’s the way it *should* be and it seeped its way from the movies into the comics.